Zynga is a leading developer of popular mobile social games, played by millions of people around the world each day. In addition to creating beloved social games such as Zynga Poker, Words With Friends and CSR2, Zynga has been pioneering on emerging gaming platforms to bring the iconic gameplay of their forever franchises to new audiences. As a part of this strategy, Zynga partnered with Google to reimagine two of their most popular games for the Google Play Instant experience. 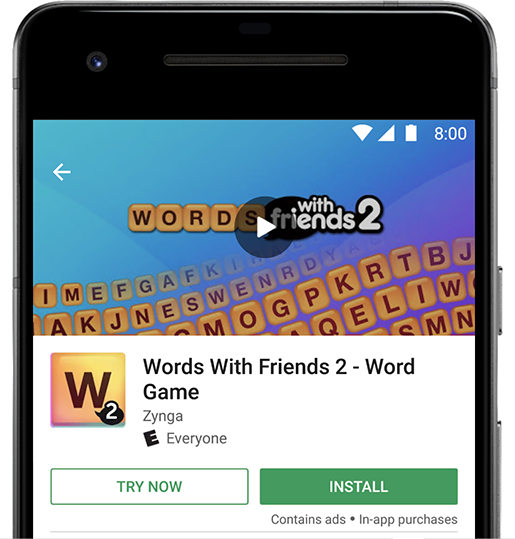 They built and launched an instant version of Words With Friends 2, which you can play by clicking the "Try Now" button on its Play Store listing. Zynga built a single-player experience leveraging the game's highly popular Solo Challenge feature where a player competes with a Shakespeare avatar for the highest score. It's a bite-sized experience that shows people what to expect when they install the full game and play through an entire Solo Challenge ladder of AI-powered bots. To increase awareness of this new, instant gaming experience, the Words With Friends 2 team added a persistent install button in the main UI. The team is also exploring ways to use instant apps to increase the conversion rate of social invites, social sharing and cross promotion campaigns. Early results show that the instant Words With Friends 2 version is complementary to existing installs. They also found that click-throughs on the "Install" button are stable, implying that the "Try Now" option is attracting a new type of player to the game, without sacrificing those who would have otherwise clicked install. "We're proud to be one of the first gaming companies innovating on the Google Play Instant platform, delivering bite-sized play experiences for fans of Zynga's Words With Friends 2 and Solitaire everywhere. We're excited to partner with Google in reimagining the iconic gameplay of our Words With Friends 2 and Solitaire titles for more than 1 billion Android players around the world in a seamless, free-to-play experience."